Are you a Watchtower slave? | Missing the point? The people who call themselves Pastors, preachers, evangelists, theologians are still mostly now no different to the people who call themselves mechanics if they have not been called directly by God to the Ministry.. Their carnal base line on how they interpret things is influenced by their predisposition, bias and personal views – they are just average carnal people. How the so called Christians have now interpreted the Bibles on the subject of future prophecies, Eternity, Heaven, Hell, Eternal security, Rapture, Zionism, jews, Cessation, slavery, status of women, power, money, righteousness, sexuality, marriage etc., has often still moved from one end of the band width to the other. A real absurdity. At every point on that bandwidth over the past 2000 years, there would have been a theologian with absolute conviction dictating his views as absolutely right , but yet today next many are horrified by some of their false thinking. History would tell us that we all now don’t always get it right and that we all still should temper our convictions and elevate our sense of humility.So if you are wondering where I stand with my faith after reading this… well, it is strong, It is Holy Spirit based – but you should stop worrying about me and worry about the false professing Christians who love to lie, slander, abuse others to judge and disrupt the honest life Jesus called us all to. Is the Jehovah’s Witness religion Christian? The answer to the question is, “No”. Like all non-Christian cults, the Jehovah’s Witness organization distorts the essential doctrines of Christianity. It denies the deity of Christ, His physical resurrection, and salvation by grace. This alone makes it non-Christian. To support its erring doctrines, the Watchtower organization (which is the author and teacher of all official Jehovah’s Witness theology), has even altered the Bible to make it agree with its changing and non-Christian teachings..
Jehovah’s witnesses are very strongly cultic in both doctrine and behaviour, thus fitting both categories of false doctrine and mind control. They believe that all true Christian churches are of the devil. They believe Jesus is not God, but is the Archangel Michael – the first being created by God. They deny that God is a Trinity. They believe Jesus died on a stake, rather than a cross. They deny that Jesus rose bodily from the dead. They believe that ony 144,000 Jehovah’s Witnesses will go to heaven. The rest will live forever in a paradise on Earth, never meeting the person who died for them – Jesus Christ. They believe that salvation is impossible outside of the Watchtower. They are not allowed to question the Watchtower leadership or teaching. They claim you need to read the Watchtower’s magazines and other material in order to understand the Bible correctly. If you don’t read the Watchtower’s books, you will “fall into darkness” – what they call reverting to normal Christianity. They have falsely predicted the end of the world five times. They have just changed a major Watchtower prediction that the end of the world would come before the generation of Witnesses born before 1914 died. They used to forbid any vaccinations or organ transplants, even to save lives. 2. Jesus is the name of the Messiah in English, this we know for certain. Y’shua is a Hebrew equivalent as is Yoshua… but YAHShua? Never heard if him… it is neither English nor Greek nor even Hebrew, it is an invention of Americans who came out of sect of the Christian Church… a sect that rejects the very religion it came from as being pagan. 3. Paul preached the unknown G-d and never once during that sermon mentioned the name of G-d, how was anyone saved? 5. You do not know the person of the redeemer because you practice unrighteous judgment based on your own false understanding of the name of G-d therefore according to the Living Torah as given by Y’shua himself, you are a stone white sepulcher full of dead men’s bones. Repent of your sins and come to Messiah… learn of the person through his Word (Davar) and his Ruach (Spirit) and you shall receive the FREE GIFT of real Salvation. Titus 1:14. Not giving heed to Jewish fables, and commandments of men, that turn from the truth. The only way anyone can know the up-to-date truths, commands and practices from God is to carefully read/study the entire New Testament for themselves. (Don’t just trust another person to teach you the New Testament. Read it yourself and change accordingly.) Thus, the HEBREW NAME MOVEMENT must necessarily cast doubt upon the record of the preservation of the New Testament scriptures by lying asserting that the New Testament was also originally written in Hebrew. It was not it was written in Greek..
Ex 6:3 And I appeared unto Abraham, unto Isaac, and unto Jacob, by the name of God Almighty, but by my name JEHOVAH was I not known to them. Ps 83:18 That men may know that thou, whose name alone is JEHOVAH, art the most high over all the earth…. The above quoted verses are the four verses where the name of God is pronounced in the KJV (as well as the ASV, and a few other English versions). There is a VERY FALSE popular movement to replace the name of God, Jehovah, with the name Yahweh. This is being pushed especially hard among those in the Identity and Christian patriot movements, and especially among the alternative news community prominent on the shortwave, which some Christians perceive of as being a source of more purer form of broadcasted Christianity. There are exceptions, but overall this is nonsense because the shortwave Christian broadcasts are frequently every bit as commercialized (just different products) and apostate as the “Christianity” that is broadcasted on TV. ABOUT THE DIVINE NAMES AND TITLES OF GOD. I. ELOHIM occurs 2.700 times. Its first occurrence connects it with creation, and give it its essential meaning as the Creator. It indicates His relation to mankind as His creatures (see note on 2Chron. 18:31, where it stands in contrast with Jehovah as indicating covenant relationship). ‘Elohim is God the Son, the living “WORD” with creature form to create (John 1:1. Col. 1:15-17. Rev. 3:14); and later, with human form to redeem (John 1:14). “Begotten of His Father before all worlds; born of His mother, in the world.” In this creature form He appeared to the Patriarchs, a form not temporarily assumed. ‘Elohim is indicated (as in A.V.) by ordinary small type, “God”. See table on page 7. Jehovah is indicated (as in A.V.) by small capital letters, “LORD”‘ and by “GOD” when it occurs in combination with Adonai, in which case LORD GOD = Adonai Jehovah. 1. JEHOVAH-JIREH = Jehovah will see, or provide. Gen. 22:14. 2. JEHOVAH-ROPHEKA = Jehovah that healeth thee. Ex. 15:26. 3. JEHOVAH-NISSI = Jehovah my banner. Ex. 17:15. 4. JEHOVAH-MeKADDISHKEM = Jehovah that doth sanctify you. Ex. 31:13. Lev. 20:8; 21:8; 22:32. Ezek. 20:12. 5. JEHOVAH-SHALOM = Jehovah [send] peace. Judg. 6:24. 6. JEHOVAH-ZeBA’OTH = Jehovah of hosts. 1Sam. 1:3, and frequently. 7. JEHOVAH-ZIDKENU = Jehovah our righteousness. Jer. 23:6; 3:16. 8. JEHOVAH-SHAMMAH = Jehovah is there. Ezek. 48:35. 9. JEHOVAH-ELYON = Jehovah most high. Ps. 7:17; 47:2; 97:9. 10. JEHOVAH-RO’I = Jehovah my Shepherd. Ps. 23:1. In verse 1, we have No. 1 above. In verse 2, we have No. 5. In verse 3, we have Nos. 2 and 7. In verse 4, we have No. 8. In verse 5, we have Nos. 3 and 4. III. JAH is Jehovah in a special sense and relation. Jehovah as having BECOME our Salvation (first occ. Ex. 15:2), He Who IS, and WAS, and IS TO COME. It occurs 49 times (7 x 7. See Ap. 10). Jah is indicated by type thus: Lord. IV. EL is essentially the Almighty, thought the word is never so rendered (see below, “Shaddai”). EL is Elohim in all His strength and power. It is rendered “God” as Elohim is, but El is God the Omnipotent. Elohim is God the Creator putting His omnipotence into operation. Eloah (see below) is God Who wills and orders all, and Who is to be the one object of the worship of His people. El is the God Who knows all (first occ. Gen. 14:18:22) and sees all (Gen. 16:13) and that performeth all things for His people (Ps. 57:2); and in Whom all the Divine attributes are concentrated. El is indicated in this edition by type in large capital letters, thus: “GOD.” It is sometimes transliterated in proper names Immanue-‘el, Beth-‘el, &c., where it is translated, as explained in the margin. V. ELOAH is Elohim, Who is to be worshipped. Eloah is God in connection with His Will rather than His power. The first occurrence associates this name with worship (Deut. 32:15, 17). Hence it is the title used whenever the contrast (latent or expressed) is with false gods or idols. Eloah is essentially “the living God” in contrast to inanimate idols. Eloah is rendered “God”, but we have indicated it by type thus: GOD. VI. ELYON first occurs in Gen. 14:18 with El, and is rendered “the most high (God)”. It is El and Elohim, not as the powerful Creator, but as “the possessor of heaven and earth.” Hence the name is associated with Christ as the Son of “the Highest” (Luke 1:35). It is Elyon, as possessor of the earth, Who divides the nations “their inheritance”. In Ps. 83:18, He is “over all the earth”. The title occurs 36 times (6 x 6 or 62 See Ap. 10). Elyon is the Dispenser of God’s blessings in the earth; the blessings proceeding from a Priest Who is a King upon His throne (cp. Gen. 14:18-22 with Zech. 6:13; 14:9). VII. SHADDAI is in every instance translated “Almighty”, and is indicated by small capital letters (“ALMIGHTY”). It is God (El), not as the source of strength, but of grace; not as Creator, but as the Giver. Shaddai is the All-bountiful. This title does not refer to His creative power, but to His power to supply all the needs of His people. Its first occurrence is in Gen. 17:1, and is used to show Abraham that He Who called him out to walk alone before Him could supply all his need. Even so it is the title used in 2Cor. 6:18, where we are called to “come out” in separation from the world. It is always used in connection with El (see above). (1) ADON is the Lord as Ruler in the earth. We have indicated this in type by printing the preceding article or pronouns in small capitals, not because either are to be emphasized, but to distinguish the word “Lord” from Adonai, which is always so printed in the A.V. (2) ADONAI is the Lord in His relation to the earth; and as carrying out His purposes of blessing in the earth. With this limitation it is almost equivalent to Jehovah. Indeed, it was from an early date so used, by associating the vowel points of the word Jehovah with Adon, thus converting Adon into Adonai. A list of 134 passages where this was deliberately done is preserved and given in the Massorah (107-115). (See Ap. 32) We have indicated these by printing the word like Jehovah, putting an asterisk, thus: LORD*. (3) ADONIM is the plural of Adon, never used of man. Adonim carries with it all that Adon does, but in a greater and higher degree; and more especially as owner and proprietor. An Adon may rule others who do not belong to him. Hence (without the article) it is often used of men. But Adonim is the Lord Who rules His own. We have indicated it by type, thus: LORD. Adon is the Lord as overlord or ruler. Adonim is the Lord as owner. Adonai is the Lord as blesser. GOD = Jehovah (in combination with Adonai, “Lord”). GOD* = Jehovah in the Primitive Texts to Elohim. LORD* = Jehovah in the Primitive Texts to Adonai. Adonai Jehovah = Lord GOD. Jehovah Elohim = LORD God. Elyon El = MOST HIGH GOD. El Shaddai = GOD ALMIGHTY. 31And, behold, thou shalt conceive in thy womb, and bring forth a son, and shalt call his name JESUS. 32 He shall be great, and shall be called the Son of the Highest: and the Lord God shall give unto him the throne of his father David:33 And he shall reign over the house of Jacob for ever; and of his kingdom there shall be no end. 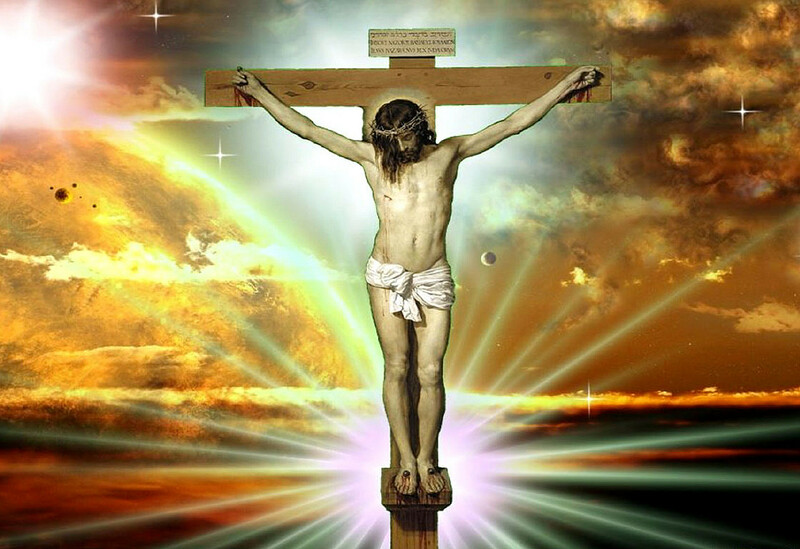 Jesus Christ is still the only name of God that you can call upon and get saved from hell today as well..
Colossians 2 18 Let no man beguile you of your reward in a voluntary humility and worshipping of angels, intruding into those things which he hath not seen, vainly puffed up by his fleshly mind, . MICHAEL THE GREAT, MIGHTY AND INVISIBLE ONE, IS VICTORIOUS OVER THE EVIN ONES IN ALL HIS BATTLES. . … But without the help of Jesus Christ he too like you are useless in all you do.. .
As for Jesus Christ Hebrews 1 4 Being made so much better than the angels, as he hath by inheritance obtained a more excellent name than they. * Discussing key Bible texts so as to reveal how the Watchtower has mistranslated or misinterpreted them. 1. “God unconditionally promised Abraham’s descendants a literal world-wide kingdom over which they would rule through their Messiah who would reign upon King David’s throne…Even the animals and reptiles will lose their ferocity and no longer be carnivorous,” (The Late Great Planet Earth, Hal Lindsay, p 165) False, God never promised any land outside Israel. Abraham was only promised the land between the River of Egypt (Wadi el-Arish) and the Euphrates. 2. “The nature of the blessings are earthly, territorial, and national, and have nothing to do with a spiritual church to which none of these blessings has been promised …Christ is not now on the throne of David bringing blessings to Israel as the prophets predicted, but He is rather on His Father’s throne waiting for the coming earthly kingdom and interceding for His own who form the church,” (The Millennial Kingdom: A Basic Text in Premillennial Theology, John F. Walvoord, p 205, 1983 AD) False: Abraham was only promised the land of Israel. 3. “The foundation of the state of Israel in recent years has been a part of the predicted regathering of scattered Israel back to their ancient land…The present partial possession of the land is a token. The complete possession awaits the coming of Israel’s Redeemer” (The Millennial Kingdom: A Basic Text in Premillennial Theology, John F. Walvoord, p 185, 1983 AD) False: the land promise was fulfilled in 1400 BC.